There's not much choice on a vacation eve, as you run screaming into it, hoping to get all your jobs done so you can enjoy yourself some, but that never quite happens to your satisfaction (you like a job done well), and tomorrow is vacation. You don't want to go into that feeling like you have to work at taking it easy and having a good time. So what else could you have on a Friday evening but a Corpse Reviver #2? You see the ingredients before you, except for the lemon already drained of its juice, since the finished cocktails are there, too. That mason jar is filled with the real cherries we're still running on from last year (and it's just about season for the next round of cherries--homemade are so much better than the bright red store-bought ones that taste like food coloring). Shake all of that in a lot of ice. Strain into up glass. Add that stemless cherry. 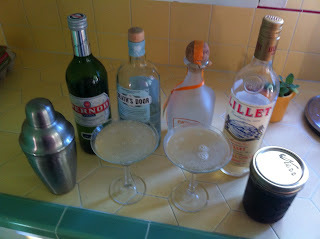 This is a sum-of-its-parts cocktail--you'd never guess at how the flavors play with each other, creating something that's easy to drink to the point you'll want a second. And two Corpse Reviver #2's are Corpse Reviver 4 whether you're adding our multiplying, so you're ok. Now go have a vacation. *Notice I did not say gin martini, for that's like saying chef Suzanne Goin or poet James Wright or pitcher Tom Seaver--some things just are what they are so don't want useless syllables.